Chic or Geek: Fashion, Feminism and Female Cyclists | One woman. Many bicycles. A simple announcement for the upcoming National Women’s Bicycling Summit on Twitter set off the conflict. A male blogger claimed there was no gender gap in bicycling, which led to swift and sharp responses. But the most heated and lasting discussion began with a tweet by a woman who was disgusted that the summit will feature a fashion show with a male host. Especially since that male host is the founder of Cycle Chic®. For those who aren’t familiar, Cycle Chic is ever-growing series of web sites from all over the world with a theme of “style over speed”. The sites feature photos from people riding bike in non-cycle-specific clothes, with a particular emphasis on fashionably dressed, attractive women. 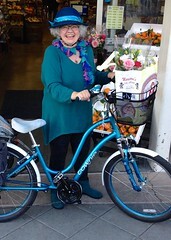 Women like my sister Patty, who wears cute little dresses and sandals on her bike in the resort town of Watercolor, Florida. The man behind the Cycle Chic web site, Mikael Coleville-Anderson, is outspoken in his view that you don’t need an expensive bike or special cycling clothes to be a cyclist. You should just hop on the bike and ride in regular clothes and regular shoes for everyday trips. No lycra, clip-in shoes or helmets required. He’s famously and rabidly anti-helmet, leading the crusade against mandatory helmet laws. But this time the controversy centered around the Cycle Chic Manifesto, which implores cyclists to be “aesthetically pleasing” and “ride with grace, elegance and dignity.” It uses gender-neutral language, but since the Cycle Chic site features women in skirts and heels more than men in suits, many felt it was imposing a beauty standard on women, not men. You can read the lively debate on Elly Blue’s Taking the Lane blog. Stepping back from the fray, my take is that dressing up on the bike is culturally disruptive, like in the 1960s when men started growing their hair long or in the 1970s when married women started keeping their maiden names. It challenges what people think is appropriate so there’s criticism as well as wonderment. 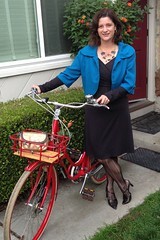 When I wear skirts and heels on the bike I get a wide range of reactions, from surprise to appreciation to annoyance. Strangers have told me they love my heels, and strangers have told me that riding in heels is dangerous. That makes me chuckle since I’m in more danger carving down mountain roads or riding steep rocky trails. Riding in heels is easier than walking in them and I’ve yet to be scolded for walking in heels. I hope the time will come where we will all look back at this and think this controversy was silly. 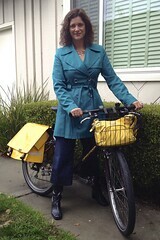 Of course some people ride in regular clothes to work or for errands or to visit friends. Of course some people put on lycra when they want to ride far or hard and get a workout. We’re all just riding along, who cares what we’re wearing? What are you most comfortable riding in: full lycra, baggy shorts, t-shirt and jeans? Do you ever ride in dressy clothes? Why or why not? I’ve never agreed with anything more in my entire life. And speaking of helmets, I’m on a mission to make them cool. As good as it feels to ride bareheaded, I love my brain too much to risk trauma. I have faith that the power of fashion can eventually transform them into stylish accessories. Thanks, Melissa, for working to make helmets more stylish. I wear helmets nearly all the time and I love having a selection of styles to choose from. We aren’t wearing helmets in Florida because the streets are unusual. The speed limit is 17 mph in the neighborhoods and there are separated bike paths along all the busy roads. There are few cars on the streets without bike paths because there’s virtually no car parking at the beach or the nearby stores. Everyone rides bikes or walks. It’s probably better set up for cycling than any small town in North America. I was very impressed. Riding there without a helmet is no more dangerous that going for a run without a helmet. I agree with you, we should all just do what fits us and not judge other people based on their outfits or gear (which is btw why I don’t care for cycle chic, the author seems to talk rather condescending to anyone who doesn’t agree with him, he needs to chill out a little). I prefer skirts and dresses in the summer, because of the “built in ventilation” and pants can stick to your legs when you sweat making it a little uncomfortable pedaling along. I don’t own cycling clothes, I only ride for fun (commute and errands are so much more fun on a bicycle :D) and don’t go very fast, so why should I buy special clothes? I don’t always wear a helmet (but most of the time) but I always wear gloves… seriously, am I the only one sliding off her handlebars after 5 minutes without gloves??? I don’t appreciate being shunned for wearing a helmet (my head, my business) I also don’t appreciate my coworkers (most of them haven’t been on a bike in decades) telling me that I should wear more bicycle appropriate clothes and a reflective vest. Most people who don’t see me coming do so because they didn’t bother looking in both directions so a vest wont make a difference. Skirts are awesome in the heat. I feel sorry for men who don’t really have that choice. I don’t need gloves even in the Louisiana heat. I guess my hands don’t sweat like yours. Further evidence why what to wear depends on the person. I do wear helmets because I feel more comfortable riding along the busier roads in them. And when I hit the trails or mountain roads I’m moving faster and take more risks. But when I ride places like this town in Florida or Amsterdam where everyone bikes and the cars are well behaved I don’t wear one and I feel perfectly safe. It’s too bad you get harassed for your choice. And I agree that M C-A can be nasty to those who don’t agree with him, but I find there’s a lot of nasty and inflexible views on both sides of these issues. Oh yea, sometimes I think: Oh, this is getting serious, they are bringing out the CAPS LOCK, hahahaha. I started out riding in jeans and t-shirt, on road bikes. I still see plenty of riders in LA, even fast ones, riding in jeans and t-shirts. As I started riding more and farther, I tried stretchy bike shorts (albeit plain black, always, no ads or logos). From one day to the next I could suddenly ride about twenty miles farther! Since I love exploring our vast region (which is also hot and hilly; I live in Los Angeles), I was pleased. However I didn’t care for the effect skintight bike clothes have on folks unaccustomed to such. No one ever bothered me, I am kinda big, but you could tell. So I designed my own line of dressyish bike clothes made out of wool–knickers, shorts, and now shirts. Not super-formal but nice enough to pass in more liberal office environments; even wore ’em to jury duty with not a blink from the judge. They’ve served me on occasional centuries, and if I want to I can put bike shorts on under them (though i don’t any more). So now, at least my bottom half is more formally dressed than ever before in my life–yet I can ride my fixed-gear road bike all over SoCal in comfort. It’s mostly my wife’s fault, as she likes me to look a little more chic than I am naturally inclined to do. 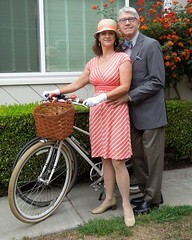 I’ve ridden in a suit, too, though not more than a few miles. Suits are highly impractical clothing for anything, including walking or sitting, so I avoid them. Nothing to do with the bike. By the way, ladyfleur, men can always wear baggy shorts, the hey-dude equivalent of a skirt. Not to my taste, but it’s an option often exercised here in LA. Where I’ve also seen riders in kilts. I finally had a moment to look at your wool knickers and shirts on your web site. Very stylish. I love wool too because of its temperature regulation properties. I have yet to see a man riding in a kilt, but if I did I’d definitely have to run him down for a photo. My views on this have changed over the last two years. At first, I was rabidly Regular Clothes. I did not need special clothes, thanks, because things were working Just Fine. Then I bought a tank top that had little bicycles on it, that happened to be a technical fabric. And it was also comfy. Eventually I got an event jersey, and even more eventually I realized I’d transitioned to wearing all technical shirts when out for training rides. I held out and didn’t get the padded shorts until the start of summer this year. I don’t bother with it if I’m just jaunting around to see friends or get food, but for anything over an hour I’m in jersey and bike shorts. I brought bike clothes the last time I went on vacation, even. And Gu, because we were doing the Lobster Ride and Roll and Gu’s what I’m used to. I think at this point, I am rabidly Whatever You Find Comfortable. 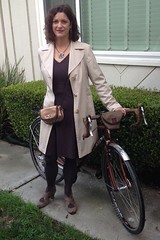 It’s funny – someone stopped me at a century ride last year, and thanked me for riding in regular clothes. She’d been part of a club, you see, up until they required her to wear full matching kit with the rest of them. She refused, they pressured her, and she left. She was happy to see someone riding in normal clothes, proving that it could be done. Part of me feels bad now that I don’t do it anymore. All that said – no matter if it’s a training ride, a trip to see friends, a trip to get groceries – I wear my damn helmet. I like my brain just the way it is. And yes, at high speed I’d be sunk helmet or no, but at low speed I think it will protect that brain. “bringing out the CAPS LOCK” is really, really true. Oy. That’s sad to hear of the woman who quit a club because of her clothing. But clubs can be like high school cliques, which always have dress codes. I read through many, though not all, of the comments on Elly Blue’s post on this subject. Jesus…Not quite sure why bicyclists are so damned opinionated (and quick to suffer offense), but my theory is that we’re all a bit prickly because we know we’re 2nd class citizens in America, and we suffer pangs of envy when MCA posts pix of beautiful people (face it, many urban Europeans look absolutely smashing compared to most Americans) on his website riding safely in settings most of us can hardly imagine. So, we wear our battle dress (helmets, neon Lycra, etc. ), misunderstood, expecting the worst, and, well, that would make almost anyone feel like Mr. Crankypants, eh? Add to that a healthy dollop of feminist/gender critique, the immediacy of the internet, and whoom! Up goes the smoke and out come the CAPS LOCK. Whatever. Ce la vie. Personally, I don’t enjoy looking like a geek anymore. Never really did. Thanks to all those images of people wearing normal clothing, I wear normal clothes most of the time when I commute, wool jerseys and shorts when I’m out for a purely recreational ride on the local rail trail, and t-shirts, shorts, and slaps when I’m at the coast. Most of the time I wear a helmet, sometimes not depending on the environment. Doesn’t mean I don’t value my brain, but I really hate busybodies. They’re annoying. And I live about 2.5 hours away from Watercolor, and it’s as Ladyfleur describes it. Is it dangerous? Less than driving. A beautiful place to hang out and ride. Did you play bocce on the greens there, Lady? You nailed it with the 2nd class citizens and Europeans dressing better than Americans (on or off the bike). And when I traveled from Paris to London and saw the difference in what people wore and how they behaved in public, I realized the UK is more American than Continental. Ah, so you’ve been to Watercolor. 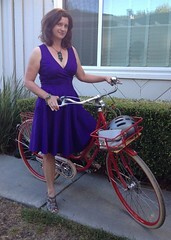 I loved it, especially the way bicycling makes getting around easy as well as fun. I didn’t realize they had bocce greens. Is it near the tennis courts? The bocce courts I referred to were set up on the grassed public areas close to the beach. They have a tournament around Christmas time. I don’t think they have permanent courts. Watercolor is extraordinary, but it’s a premium product. Did you know Karl Rove has a house there? I didn’t know above Rove, but yes, Watercolor is definitely very high-end. But unlike other resorts aimed at this demographic, it’s not gated nor situated on a golf course. I also like that the yards are left natural (no lawns) and they don’t allow on-street parking. I found a celebrity sightings list for the Watercolor area: Brittney Spears, Faith Hill, Bette Midler, Ben Stiller, Jane Seymour. My personal fave is Jeff Foxworthy in Watercolor. Not quite like his redneck image, which would be more at home in nearby Grayton Beach. “Middle-aged gentleman shaped rather like a pear, and dressed entirely in pink Lycra” Not a good look at all. I can see how it had such an impact. I pretty much wear a dress/long skirt almost everyday riding my Peugeot SS mixte and the style I wear REALLY stands out that a lot of the usual drivers on my commute recognize me. This confirms it from many of my coworkers who drive to and from work telling me, “I saw you riding to work!” along with questions concerning if my skirts ever flip up or anything (I am impressed that this never happens). One comment that stood out to me was “I saw this cyclist while I was driving and I know it’s Jill because no one dresses like her!” I also get comments from other commuters who are worried that my skirt might get caught in the spokes/chainring which also has never happened. I do enjoy the attention even from lycra’d up commuters who snub me at my fashion choice being “impractical” for cycling 😛 Little do they know that I too lycra up and take out the roadie on long workout rides. I forgot to mention I always wear my helmet too even though most of my fashion snap photos has my helm hidden from view. I’m quite used to it but eventually I do want one that matches me best (I want to decorate it with flowers and lace! I know it’ll look silly but I don’t care! XD). The one I’ve been using is too roadie on my “morigirl” self but I’ve been using it since I had my first road bike. I looked at your Tumblr. Very cute outfits! One of my bikes has a skirt guard to keep long skirts out but I don’t know that I’ve ever needed it. As for the lycra dudes and dudettes, they have no idea how practical it is to just ride in your regular clothes when you’re not trying to get a workout. And I don’t usually photograph my helmets, but I always wear them except when I’m riding in places like Europe where nobody wears them and they don’t make you ride in fast traffic. I wear performance clothing because my rides are mostly 25 miles or longer. I rode in regular when I was commuting 16 miles each way, however. I have stopped following Elly Blue because I feel that her blog is often rife with misandry (men-hating). Disliking Cycle Chic is not feminist, it’s merely a critique against fashion; fashion is inherently concerned with superficial topics (what you wear) whether you’re a man or a woman. Recently, Elly Blue also wrote an article about tokenism which I found somewhat absurd, and via twitter she suggested she had suffered ‘systemic discrimination’ based on her gender in the cycling community. Systemic discrimination suggests that there is a conspiracy of men who are inhibiting or discouraging you from cycling because of your gender. While you may encounter some chauvinism in the cycling community, no one debates a woman’s right to ride a bike. It’s just the same baseline discrimination you encounter anywhere. I regret that the cycling community, which is predominantly supportive men, is dragged into this kind to conversation for sensationalist clickmongering. 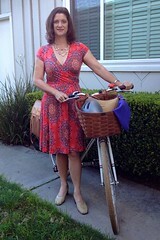 Infighting about how a woman looks on a bike is small minded, whether it comes from Cycle Chic or Elly Blue. I don’t really wear dresses that much in general. I don’t feel any less a woman due to it, on or off the bike. Great article though!